130 mm/50 B-13-IIs5 х 1 pcs. 76 mm 81-K1 х 2 pcs. 37 mm Flakzwilling 301 х 2 pcs. 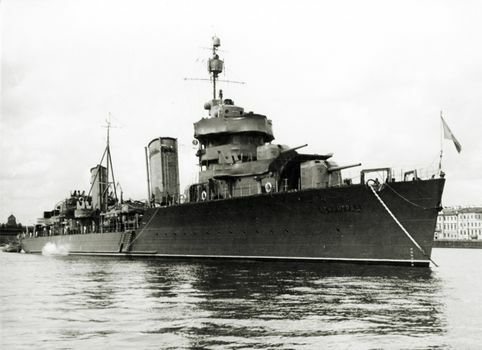 Leningrad — Soviet premium Tier VII destroyer. Leningrad first went on sale on 10 October 2016 on the NA servers, and on 5 October 2016 on the EU servers. Leningrad may initially seem like a Tier VII Gremyashchy with an extra gun and quadruple torpedo launchers (instead of triples). Her 43 knot top speed (reaching nearly 46 knots with Engine Boost ( ) active) means she can avoid some incoming fire by simply outrunning it, and her high velocity guns give her the ability to pepper targets at range where she can not be reliably hit. However, she has a much wider turning circle in exchange for her higher top speed, causing her to drift when turning. This can sometimes lead to accidentally hitting torpedoes her captain thought they had dodged. Her torpedoes are more powerful than Gremyashchy’s, with 700 more damage and 5 knots faster speed in exchange for a longer reload due to the quad mount launchers. The main battery guns are in an odd layout, with an anti-aircraft mount blocking the rearmost gun from firing aft, and the third gun located aft of the bridge; in order to fire all her main battery weapons simultaneously, Leningrad needs to expose a great deal of herself to return fire. Overall, Leningrad trades a worse gun layout from the regular tech tree Tier VIII destroyer Kiev for better torpedoes, making her an interesting hybrid play style ship, able to both function as both gunboat and torpedo boat depending on what the situation calls for. Good main battery rate of fire and shell velocity like all other Russian destroyers. Fastest destroyer in her tier: a whopping 43 knots. Great rudder shift and handling characteristics for a Russian destroyer. Decent concealment, identical to Tier VII USN premium destroyer Sims. Good torpedoes; can fire torpedoes from beyond her detection radius, similar to Gremyashchy. Typically large turning radius for a Russian destroyer. Anti-aircraft armament is underwhelming. Don't expect to shoot down any planes. Poor turret traverse, only slightly better than Tier VII Japanese counterpart Shiratsuyu. Insane ship drift at mid-to-high speeds while turning, even when slowing down. As a Premium ship, Leningrad doesn't have any upgrades to research. With only four upgrade slots to fill, there isn't a lot of variety of choice for fitting out Leningrad. Main Armaments Modification 1 is the natural pick for Slot 1'; for Slot 2, the choice boils down to captain's preference between Aiming Systems Modification 1 to improve the accuracy of her main battery, or Main Battery Modification 2 ( ) for faster turret rotation. Captains who have opted for Last Stand over Expert Marksman as a Level 2 commander skill will probably want the latter. Remaining upgrade slots are best used for Propulsion Modifications 1 and 2, in order to increase the reliability of her engines. Leningrad is dependent upon her speed for defense; these two mods help contribute to her survivability in that regard. Like her tech tree cousins, Leningrad plays more like a light cruiser than a destroyer. She will greatly prefer to hold enemies at arms' length when possible, maximizing the accuracy, muzzle velocity, and user-friendly firing arcs of her main battery. Captains will want to focus their skill points on improving her main battery and maximizing her survivability. Keeping Leningrad’s engine in working order is paramount to her survival; captains are strongly recommended to spend the credits (or doubloons) on Damage Control Party II ( ) for the reduced cooldown on repairs. 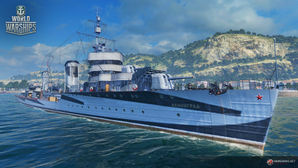 As a Premium ship, Leningrad comes included with Type 10 camouflage that lowers her detection radius, reduces the accuracy of incoming shells, reduces her repair costs, and increases the amount of experience she earns. Leningrad fires a volley of torpedoes. Leningrad fires a broadside from the safety of smoke. Leningrad passes the sinking wreck of an enemy Scharnhorst. Leningrad celebrates victory in Saint Petersburg. Flag of Leningrad. Given to players who purchased a special bundle containing Leningrad. Leningrad at anchor, date and location unknown. Propulsion power was provided by three geared turbines supplied from three superheated water-tube steam boilers, driving three propellers. The total design power of the turbines was 66,000 HP, capable of propelling the ship up to 40 knots with emergency power up to 43 knots. Maximum speed was restricted only on calm sea because at maximum speed, the ship trimmed excessively. Leningrad was initially equipped with welded, geared turbines to save weight. Initial sea trials showed that the gears were unreliable. Subsequently, the gears were replaced with heavier and simpler cast gear. During operation, it was found that the use of the superheated steam system led to a sharp increase in corrosion of boilers and turbine blades. Combined with accumulation of soot in the firebox and inadequate water supply, this led to restrictions on boiler operations at maximum power to prevent boiler failure. Leningrad was fitted with 130mm/L50 B13 guns in five single mounts. This arrangement allowed for gun elevation up to 45 degrees and a traverse rate of 5 degrees per second. He was also fitted with two sets of four-tube 533mm (21 inch) torpedo launchers mounted along the centerline of the ship. The slow launch velocity of the launchers restricted the firing angle to a few degrees broad on the beam, otherwise the torpedoes risked hitting the deck as they left the tubes. Leningrad was commissioned in 1936, participating in sea trials and testing until assigned to the Baltic Fleet in 1938. He began his wartime service in 1939 with the declaration of war against Finland, where he participated in naval gunfire missions in support of Soviet forces in Karelia. Later that year, after the occupation of the Baltic states of Latvia, Lithuania, and Estonia, Leningrad was re-based at Tallinn, Estonia. Leningrad saw the majority of his wartime service after the German declaration of war on the Soviet Union in 1941. Leningrad was again active in naval gunfire missions, now in support of the Soviet forces which had been stationed in the Baltic states. During the evacuation of the port of Hango, Finland, Leningrad was severely damaged by mine and laid up in his namesake city of Leningrad for repair. Having made good the damage, Leningrad again participated in naval gunfire support, this time in the defense of Leningrad itself. Leningrad continued this support until 1944 when the siege of the city was finally lifted, at which time he rendered support for the now advancing Soviet armies to the end of the war.